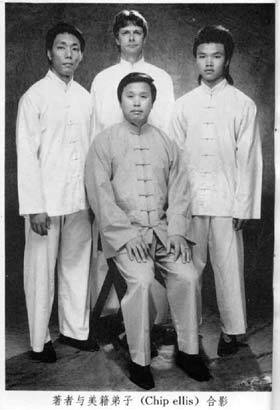 To the left are Dong Zeng Chen (front center), Alex Dong (right side), Randy Kim (left side - Randy began his studies with Tung Hu Ling and now studies with Dong Zeng Chen), and me. The portrait was taken about 1990 in Honolulu, Hawaii by Jerry Chong. Click here to see pictures of the spear set as shown in Yang Chen Fu's 1931 book. It features Tung Ying Chieh as one of the players. I believe the other player is T'ien Chao Ling, shown as Yang's number one disciple in his book. Click here to see pictures of the spear set as shown in a book by Dong Jun Ling's student. It features Tung Ying Chieh and his disciple Lin Bo Yan. Also included is a picture of Tung Ying Chieh performing a spear (staff) posture at a demonstration in Thailand. Tung Ying Chieh was reportedly the first person to popularize Taijiquan in Thailand. Other teachers had tried, but were kicked out by the Thai boxers. Tung Ying Chieh met their challenges and defeated them convincingly. As a result they flocked to learn Taijiquan from him. It is said that he had some 10,000 students in Thailand. Click here to see pictures of Tung Hu Ling doing a few moves from the Yang style slow set, the Yang style sword set, and push hands. Click here to see pictures of the masters in our lineage. Click here to see pictures from the seminar.